•TWO Dungeon Play Parties ONSITE! 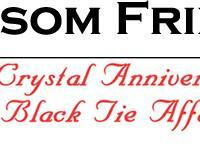 THIS YEAR'S THEME Black Tie & Crystals Affair!! FolsomFringe is the signature event of smOdyssey, Inc. It is held every year on the same weekend as the world famous Folsom Street Fair. It is a wonderful complement to other Folsom Street Fair activities for leather and kink folks of all persuasions.